Last year my husband won the Windhammer Commendation Award for Short Gamebook Fiction for a game he wrote about a bank heist. He's really the reason my antenna went up when I saw mention of this book on tour. 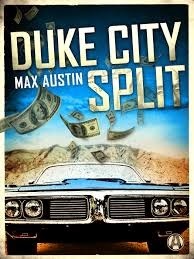 His story put me in the mood for similar type stories, and so I was excited when I first came across mention of Max Austin's Duke City Split. Bud Knox is your average stay at home dad. He is raising two daughters, picks them up from school, takes them to their soccer practices, cooks for his wife, and has made a decent life for himself. Money can be tight, sure, but they make do. His wife, Linda, is in real estate, and Bud does some internet stock trading on the side. His real profession, however, is robbing banks. So, maybe he's not the average dad after all. Bud and his partner Mick Wyman have been robbing banks together for years and never been caught. Mick is the complete opposite of Bud. He's the tough guy, the strong arm, the one you look at and know he's probably got a criminal past. When Mick is approached by a stranger about a lucrative bank job, Bud has some doubts. The two have been careful to avoid stealing money in their own backyard of Albuquerque, New Mexico. Things could get messy too fast. There's also the fact that they have only ever worked with each other. Who is this new guy and can they trust him? What follows is an exciting and fun caper mystery about a bank robbery and just how hard it can be to hold onto the loot. Bud and Mick find themselves being chased by not only the good guys, but the bad ones as well. It was easy to fall on the side of Bud and Mick, even when the dirty work needed to be done. I found myself hoping they'd come out on top and evade arrest, even knowing had it been real life I would feel completely different. There is a lot of action in the novel and some self-reflection, but if you are looking for strong character development, you won't find it here. Some of the characters are a bit cliche, but they added to the charm of the novel. Can I just say how much I appreciate Bud's relationship with his wife? There was no drama about keeping secrets from each other--it was refreshing. Duke City Split was as entertaining as it was suspenseful and I enjoyed it quite a bit. I gasped at times and could not help but laugh at others, even as dark as the novel was. Going in I had not idea this was just one book in three planned. For those adverse to series, don't dismiss this book outright. It reads as a stand alone; even the ending seemed pretty final. I am anxious to see where the author will go with the next in the series. To learn more about Max Austin, aka Steve Brewer, and his books, please visit the author's Facebook Page or his blog. I hope you will check out what others had to say about Duke City Split on the TLC Book Tours route! Many thanks to the TLC Book Tours for the opportunity to be a part of this book tour. E-copy of Duke City Split provided by publisher. Well, you caught my attention. I'm not usually interested in bank heists, but this one might be an exception! Jenclair - This book falls in the "over the top" category, I suppose, but I was having such fun while reading it, it didn't matter. Thanks for the great write-up on DUKE CITY SPLIT. I've written a lot of crime novels, and it's one of my favorites. I've got two more Max Austin books coming from Alibi soon. Mr. Brewer - Thank you for stopping by! I will be watching for the next two books to come out, and am looking forward to reading them. I definitely would like to read some of your other books as well. I can't pass up a good mystery. Glad you enjoyed Duke City Split, I'm reading this one as well and it does sound like a fun caper. Neat about your husband winning the award! Naida - I hope you like it, Naida! I look forward to reading your thoughts on it. I'm so glad to see my husband writing again. He was in such a slump for awhile there and last year was the second he'd entered the contest. He did better with his first submission, but story-wise, this most recent one was better, I thought. This sounds like a pretty good read! I love the idea of the pair being bank robbers on the side...who does that? I hadn't heard of this one until your review but I will be seeking it out. Great review! Samantha - Bud and Mick are such great characters. I think you would like this one! How exciting for you and your husband. Duke City Split sounds like a fun read and is definitely one I'll add to my list of books to kept in mind for future reading. Duke City Split was so much fun. I know I keep saying that, but it was. I can't wait to read the other books in the trilogy. How lovely for your husband! I remember my senior year in college my senior paper was chosen to be published in the history department's undergraduate yearly publication. That feeling was absolutely amazing, to know that my paper was chosen to be one of five articles featured ... from the entire history department! It's an awesome feeling to have that kind of recognition!! I just finished reading this book. Going into it I assumed it was a standalone book ... but that ending! I *have* to know how everything ends up now! Great review!! Tara - How cool was that, Tara?! What an honor to be recognized that way! I'm really wondering where the author will go with the next book too. Thank you! Congrats to your husband - that is way too cool! This story sounds fun but what a "risk" the author took to make the protagonist be a bad guy really, right? I like it when authors can pull that off. I'm thinking in particular like the Dexter series. Yes, it is a risk--especially when you want that character to be likeable. I love the Dexter books. I need to get back to the series. Dexter is such an interesting character--and I love how the author reminds me that he isn't a good guy just as I start empathizing with him a little too much. Wow, certainly NOT an average dad! Sounds like a fun and fast-paced story! Heather - No, he certainly wasn't. :-) I really enjoyed the book and look forward to reading the next one. Thanks so much for featuring me on the TLC Facebook page! Oo, I like how this ties into WIAN, pretty creative. Glad you enjoyed it, Wendy, and that's a fun cover for sure.